John Haskell King was born, according to his grave marker in Arlington National Cemetery, in Sackets Harbor, New York, February 19, 1820. His Army file, however, reflects that he was born in Michigan, where he was taken by his parents as young boy. In any event, he was appointed a Second Lieutenant of the 1st United States Infantry from Michigan, two months before his 18th birthday and was promoted to First Lieutenant in 1839, and to Captain in 1846 1846. He served in Florida against the Seminoles, on the frontier at Vera Cruz during Mexican War, and in Texas where, at the beginning of Civil War, he defied insurgent authorities and brought 9companies of Regulars safely to New York. He commanded detachments of Regular troops at Shiloh, Corinth, and at the battle of Mufreesboro (Stone's River), where he was wounded. In April 1863, he was appointed Brigadier General of Volunteers to rank from November 29, 1862, and at the first day at Chickamauga again commanded a brigade of Regulars in Baird's Division of George Thomas' XIV Corps, which along with Brannan's Division of the same corps, "were thoroughly beaten up, fell back and were practically out of action for the rest of the day." The following day, however, they fought magnificently on Horseshoe Ridge, doing much to save Rosecrans' Army from destruction and sustaining largest number of casualties of the battle. In the course of the Atlanta Campaign he was in brigade and divisional command, and was present at Resaca, New Hope Church, Kennesaw Mountain, and Peachtree Creek, commanding for a time the 1st Division of IV Corps. 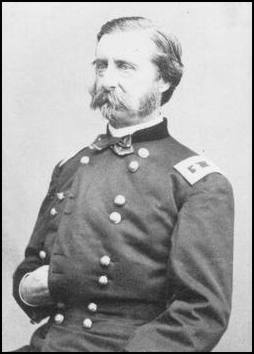 From July 1864 until the end of the war he commanded a brigade of five battalions of Regulars in the District of the Etowah under General James B. Steedman. He was brevetted Major General in the Regular Army on March 13, 1865, and in the Volunteer service on May 31, 1865. "Until the day breaks and the shadows flee away."